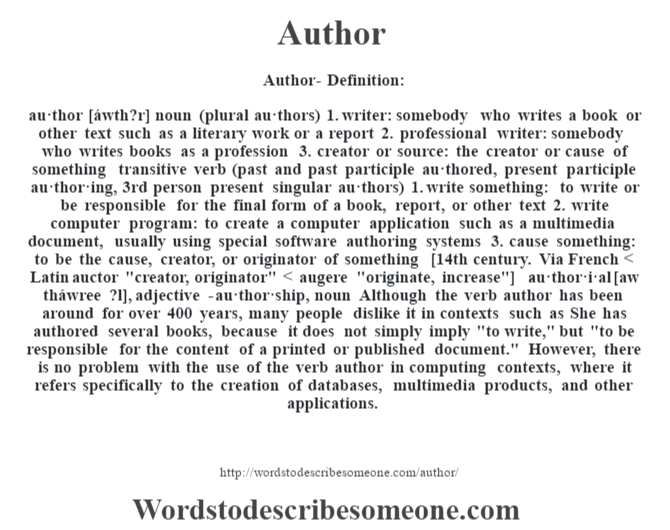 au·thor [áwth?r] noun (plural au·thors) 1. writer: somebody who writes a book or other text such as a literary work or a report 2. professional writer: somebody who writes books as a profession 3. creator or source: the creator or cause of something transitive verb (past and past participle au·thored, present participle au·thor·ing, 3rd person present singular au·thors) 1. write something: to write or be responsible for the final form of a book, report, or other text 2. write computer program: to create a computer application such as a multimedia document, usually using special software authoring systems 3. cause something: to be the cause, creator, or originator of something [14th century. Via French < Latin auctor "creator, originator" < augere "originate, increase"] -au·thor·i·al [aw tháwree ?l], adjective -au·thor·ship, noun Although the verb author has been around for over 400 years, many people dislike it in contexts such as She has authored several books, because it does not simply imply "to write," but "to be responsible for the content of a printed or published document." However, there is no problem with the use of the verb author in computing contexts, where it refers specifically to the creation of databases, multimedia products, and other applications.